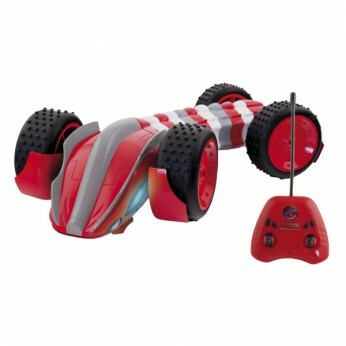 Radio control snake with an articulated, flexible body that allows it to slide and bend like a snake. Features light up eyes. Batteries required 1 x 9V and 6 x AA…. This amazing Remote Controlled Turbo Snake has an aerodynamic design with a flexible snake shaped body so you can make it slither like a snake. You will be amazed at the movements distorting it’s long structure to execute the most amazing bends and the eyes illuminate when you turn it on. You will make it go anywhere with it’s aerodynamic design and flexible body. The eyes illuminate when you turn it on; One supplied; Size H9, W20, L42cm; Batteries required: 6 x AA (not included). For ages 3 years and over; EAN: 8421134007321. WARNING(S): Not suitable for children under 3 years old. Only for domestic use; To be used under the direct supervision of an adult. * 1298440 34.99. This toy costs approximately £29.99 (for the latest and best prices make sure you check our retailer list for the Turbo Snake above). In our review of Turbo Snake we classed it as being suitable for ages 6 years, 7 years, 8 years but recommend you check the manufacturer specific advice before purchasing.